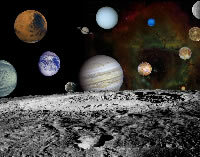 The NASA photo seen here is a montage of the planets found in our Solar System. It's fun to see the family group all together in one picture. These are the planets that will be found in your horoscope chart. My approach to chart interpretation is to first locate the Sun in your chart. The Sun represents YOU - the King of the chart. As the Beatles' song goes: "here comes the Sun King". The Planets and Asteroids surrounding the King guide him, counsel him, and advise him. Their jobs are to support you, the Sun King. Thus, you're in charge. You tell the Planets in your chart what help you expect from them. Things have changed. We don't have to be passive recipients to the planets' movements. That old concept is over. It doesn't apply any more. Once you know the parameters of your chart, use the chart as an aid to help you become successful in life. Since an astrology chart is printed in symbols, I first "translate" these astro-glyphs into English. Then we can explore the Chart's wealth of information focused towards the physical, emotional, mental and creative energies that influence your daily life. Note: Your time of birth is required to cast a Birth Chart Horoscope. If your birth certificate does not list a birth time, you can order a Vortex Numerology ChartTM as a substitute. A birth time is not required to create a numerology chart. Either way, the personal information presented in both a numerology chart and an astrology chart are equally beneficial.